A recent uproar between an Oviedo community association and some of its unit owners has garnered significant media attention. The Bentley Woods Homeowners Association in the Orlando suburb has been the subject of several newspaper and TV reports, opinion columns and letters to the editor over the association’s decision to demand the removal of a “Little Free Library” from the front yard of one of its homeowners. The library in question is a red wood box that resembles a birdhouse and is mounted on a sturdy wood post. The box, which is 24 inches tall, 20 inches deep and 24 inches wide, is part of the “Little Free Library” (www.littlefreelibrary.org) nonprofit organization’s network of free book exchange boxes that encourage reading and enable people to share books with their community. While popular in the central part of the state, there are approximately 10 Little Free Libraries in the South Florida area and more than 60,000 Little Free Libraries across the country. The news reports indicate that within a few days of homeowners Bob and Autumn Garick installing the library box in their front yard, the property manager for Bentley Woods wrote to thank them for their efforts and suggest that they move the box to a common area in the neighborhood. The Garicks declined the offer, noting that the suggested area was about a half-mile from their home and would make it impractical for them to maintain the library. 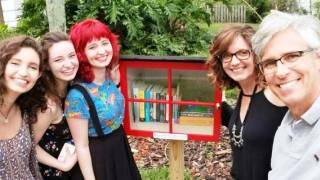 The Garicks of Bentley Woods in Oviedo pose with their Little Free Library. The correspondence from the property manager also requested that the Garicks submit an architectural review application for the library, and the Garicks complied and submitted the documents. Bentley Woods responded four days after receiving the application with a rejection letter informing the Garicks that their request for the small lending library at their home had been disapproved, without citing a specific reason. Disappointed with the association’s denial, the Garicks carried a petition door-to-door in their community which proclaimed: “I like the little library on Bentley Street. Please let it stay.” About half of the 200-plus households in the enclave signed the petition, and the Garicks also replaced their original library with a scaled down birdhouse-shaped box near their sidewalk. Apparently these efforts did not sway the association to reconsider. Its attorney sent the Garicks a letter demanding that they take down the box and pay the association $195 for its legal fees involving the matter. The situation appeared likely to be headed to arbitration or litigation, and the resulting news coverage and opinion columns helped to fuel the narrative that homeowner associations overzealously apply their rules and restrictions to the detriment of their homeowners and communities. An Orlando Sentinel columnist wrote a searing commentary about the case: “The association went to the trouble of paying a lawyer to write the Garick family, demanding that they remove the box filled with children’s books. Yeah, we can’t have those brats educating themselves. Sigh. ... Some 69 million Americans — roughly 21 percent of the population — live in communities regulated by little Hitlers and their powerful boards. Here’s one homeowner you can count out,” wrote Lauren Ritchie. A fellow Orlando Sentinel columnist had a more balanced point of view. Scott Maxwell’s column on the case concluded: “HOAs can be absolute pains in the rear, run by miserable people who get their jollies chastising others for improper grass heights and mailboxes 12-square inches too big. But many can also add real value to a neighborhood — and be run by genuinely good people who want everyone to be happy. If you’re not willing to take that chance, don’t live in one. It’s easier said than done if you’re already in a home. And it will certainly limit your home-buying choices. But it also means you won’t end up in court over a birdbath,” he wrote. As this dispute demonstrates, it can be very difficult for a board of directors to find the most reasonable and effective solutions to some of the questions that communities often face. The best approach for directors is to discuss any challenging issues with highly qualified professionals, research how other associations are responding, determine the pros and cons of various responses including monetary costs, and finally make highly informed and well thought-out decisions. For Bentley Woods and other associations facing a relatively minor issue that has led to an outcry by their unit owners, the best approach is often to address the issue and advise the residents that the topic will be discussed at an upcoming board meeting. Perhaps if Bentley Woods had held an open meeting to discuss the issue from the onset, a compromise such as allowing the library box to remain as long as the homeowners agree to remove it whenever a hurricane watch is issued could have been reached. Unfortunately, such an outcome was not in the cards for Bentley Woods, as the association silenced discussion of the Little Free Library issue at its May board meeting by indicating it would not comment on pending legal issues. In the latest news report from July 13, the Orlando Sentinel wrote that all seven members of the community’s board have since resigned as directors, and they appointed Autumn Garick and two other homeowner volunteers as their replacements. A 17-year resident of the community, Garick is quoted as saying that she hopes “to be part of a board that is transparent, consistent and kind,” and she notes that the library has been saved. By addressing community-wide issues at an open board meeting and picking their battles very selectively, associations can take important steps to avoid disputes and prevent them from playing out in the local media.